The time has come. Today’s photo is of a a balloon race over Dutchtown in 1914. The street with the streetcars is Grand Boulvard. The perpendicular street is Meramec, running east to west, bottom to top of photo. 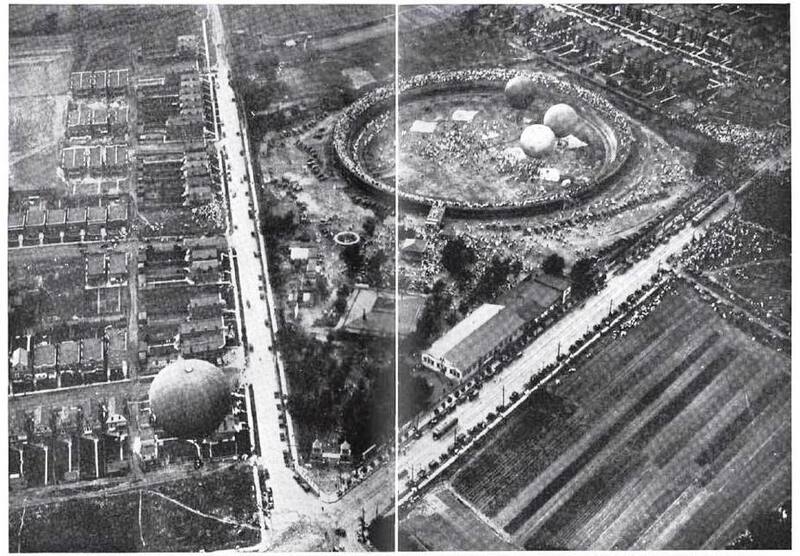 Who knew there once was a nearby park close by with a Motordome where semi-psychotic motorcyclists raced on a circular banked wooden track and held balloon races to boot? Here’s the photo caption: Priester’s Park, where the balloons started. Photographed from the Uncle Sam at an altitude of 2,000 feet by Mr. W. H. Trefts. The balloon on the left is about 1,000 feet from the ground. For more information about the Motordome, which was eventually replaced with residential neighborhood, click here and here.